—This article by Jerry Cates and Ashley D., first published on 7 April 2010, was last revised on 24 April 2016. © Bugsinthenews Vol. 11:04(05). “My mom and I found this snake on our porch. We’re not sure what kind it is; all we know is it is a baby snake. It is interesting that Ashley and her mom thought this was a snake. Most mistake it for an earthworm. Its tiny eye spots are covered by a thick scale, and are nearly hidden from view. Blind snakes are nonvenomous snakes with degenerate eyes covered by opaque head scales. They are found in practically all regions of the world where termites and ants (which they prey upon almost exclusively) abound. These serpents are grouped, taxonomically, in one superfamily, Typhlopoidea, which is, in turn, divided into the three families Anomalepidae, Leptotyhphlopidae, and Typhlopidae. Only one of these families (Leptotyphlopidae) is represented in the U.S. and Canada. Here, the family is represented by but one genus(Leptotyphlops) and two species (L. humilis, commonly known as the Western Blind Snake, and L. dulcis, commonly known as the Texas Blind Snake). 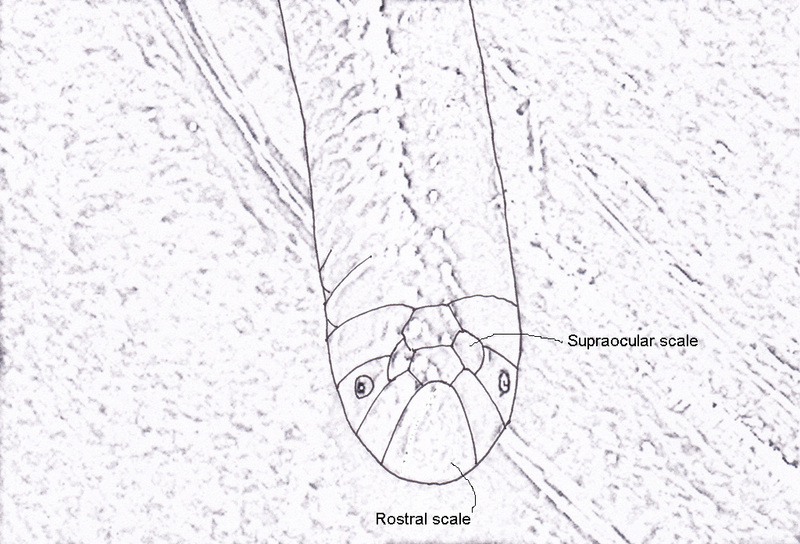 Distinguishing between the two species requires examining the head of the snake under sufficient magnification to discern the arrangement of scales between the specimen’s degenerate eyes. 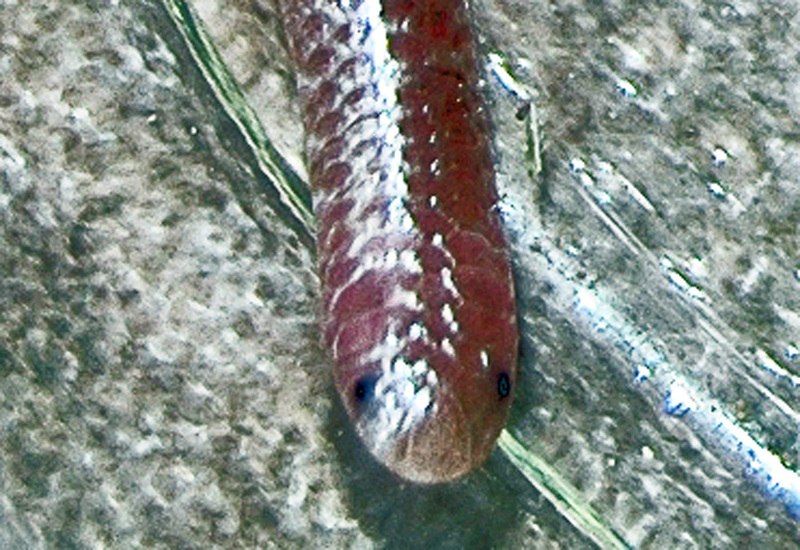 If the scale pattern in this area does not include separate supraocular scales between the lateral scale over the eye and the spinal scale, the snake is a Western Blind Snake (L. humilis); but if the supraocular scales are present, it is a Texas Blind Snake (L. dulcis). Rarely do I receive photos of blind snakes (actually, photos of blind snakes are just plain rare, period) of sufficient resolution and quality to enable such an examination. However, Ashley’s photos are outstanding, and they clearly show that–with her specimen–the supraocular scales are present. Thus we can say, with certainty, that this is a Texas Blind Snake. What we cannot do, unfortunately, is determine its subspecies. 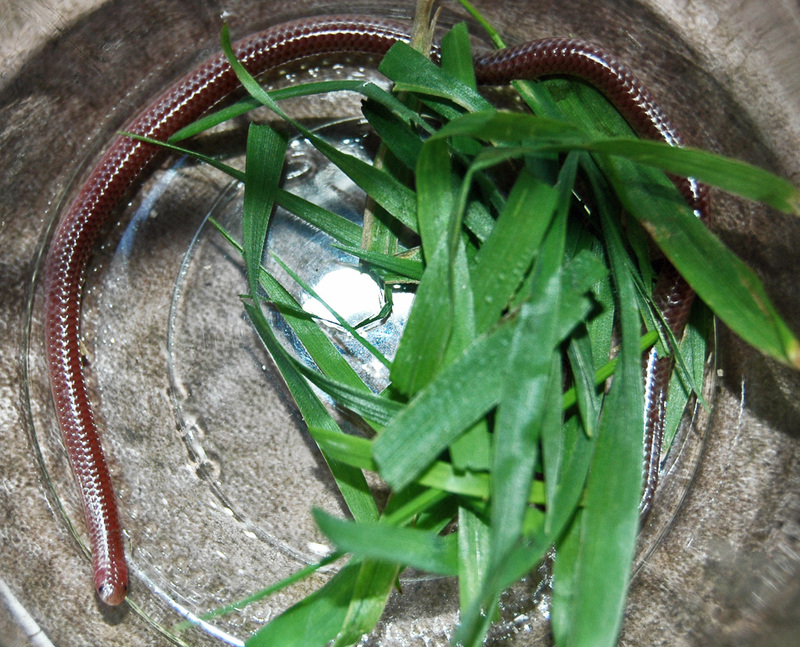 This species of blind snake has two recognized subspecies, the Plains Blind Snake (Leptotyphlops dulcis dulcis), and the New Mexico Blind Snake (L. dulcis dissectus). Both subspecies are found in Central Texas, though the former is by far more common than the latter. To distinguish between them, we’d need to see the arrangement of the lateral head scales, just anterior to and below the eye. One of the interesting features of the blind snakes is the way their scales look to the naked eye. Harry W. Greene, in his 1997 book “Snakes: The Evolution of Mystery in Nature”, p. 143-4, relates first how Frank Wall, writing in 1918, complained about the difficulties he encountered trying to discern the true outlines of the scales of specimens he examined. I found a South Texas Threadsnake, Leptotyphlops dulcis rubellum, this past weekend under a piece of carpeting behind the Stockman Motel in Hebbronville, Texas. We moved to Cedar Creek,Tx in January and since that time, I have found eight or nine of these little guys on our propery. My dog had found a dead one and was toting it around in his mouth so I took the snake to the vet with me and they told us it was a baby hognose- I am glad to finally learn what these little guys are and that they are not harmful as I do not like snakes in general. I have been pulling up grass in the flowerbeds and pulled them up several times in clumps of grass. Too cool- the things we learn and see around here. Found one today in odessa, tx. Gave it to my son to keep as a pet. I just want to thank you for helping me identify this tiny creature that my wife found on our patio. I searched many other sites but none of them had what I was looking for. Because of you we are now more educated about wildlife in our area. Just found a Texas blind snake (Leptotyphlops dulcis dulcis) in Austin. Running the weed Eater and he popped out (unharmed). Great specimen. 5 1/2 inches long. How do you get rid of these baby snakes. Somehow they are getting into my sonroom which has brick at the bottem and glass windows at the top. I have put out sticky paper boards to catch and I have collected fifteen so far. How are they getting into my sun room covered with brick. Ocassionaly I have found a few in the other parts of the house. I do not feel comfortable with any kind of snakes in my house. Please HELP and tell me How to get rid of them. Thank You Very Much! Editor: Blind snakes prey on ants and termites, and both of these can be present in the walls of your home. If your Sunroom is close to a bathroom, you may have a bath trap under the bathtub or shower that is infested with termites. If so, the blind snakes are there eating the termites. It might be a good idea, therefore, to have a pest manager inspect your home for termites. I found one dead on our front porch then a few days later fount an alive one in our closet inside of our home.